What happens to community lands a millennium on? A look at Europe. By Liz Alden Wily and Fabrice Dubertret, Members of the LandMark Operations Team. Do community-held lands thrive today in Europe? If so, what can communities in Asia, Africa and Latin America learn from their long experiences? 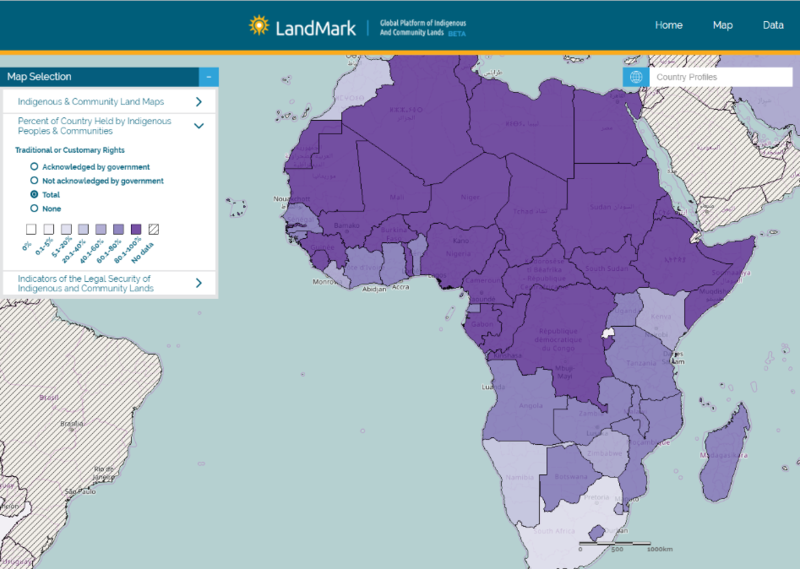 This was the topic of a Practitioner Lab hosted by LandMark : the Global Platform of Indigenous and Community Lands at the XVI biennial conference of the International Association for Study of the Commons held in Utrecht on the 10th of July. A panel of four experts from Europe (Monica Vasile, Romania; Evelyn Dietsche, Germany; Rita Serra, Portugal; and Pedro Medrano, Spain) helped participants understand the realities of commons in their countries today. Pedro Medrano represented the Soria Forest Association of Spain, winner of the Elinor Ostrom Practitioner Award 2017. What has happened to community lands (‘commons’ or ‘commonage’ in Europe) is of interest to the 2.5 to 3 billion people who globally hold such lands under customary or other contemporary forms of collective ownership today. Globally, the total community land estate could be more than 6 billion hectares. In Africa, they cover up to one half to three-quarters of most countries (see Map 1). Yet legal acknowledgement and protection of this possession is still erratic. Involuntary dispossession still poses a risk for millions or rural landholders in Asia, Africa and Latin America. Forests, pastures, and other lands which communities retain and use as collective assets tend to be most vulnerable. Although legal inroads against dispossession have been made in all regions since the 1990s, state preference for privatization widely prevails, as does assumption that valuable forests and pastures are only safely be owned by the state. The story is not so different in Europe. Over several centuries, successive land reforms drastically reduced the extent of common lands in favor of individualized private ownership, and in which relatively few may benefit. Nevertheless, commons retain their presence, and span from Ireland in the west to Romania in the east, covering millions of hectares of shared pastures and forests in at least 21 countries. 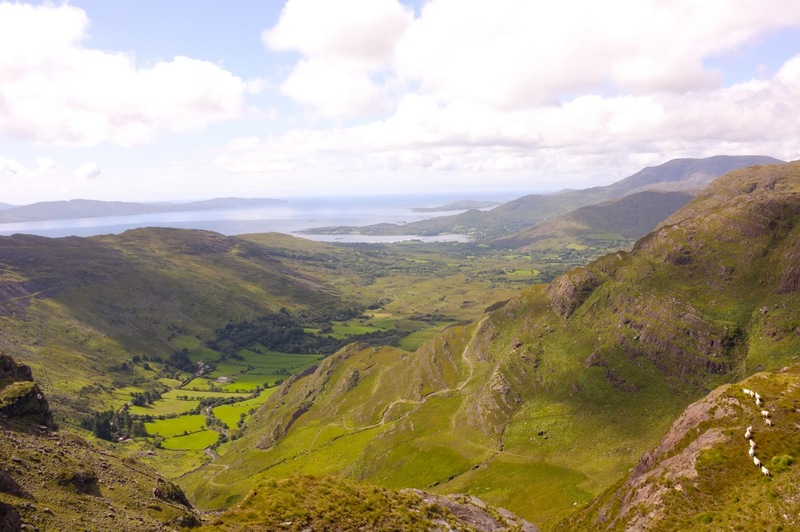 Their scope varies from a few hundred hectares in Cyprus, to hundreds of thousands hectares in Ireland and England, up to 3 million hectares of forest in Spain. Ownership systems are as varied. In some cases, collective title has been registered to communities or other local collectives, including to farming and grazing associations or to statutory bodies created to hold title. In other cases, local governments hold these lands on behalf of communities, or even churches such as in Germany. Or, local residents share historical rights to a local commonage much in the way their forefathers have done for centuries, as it is the case for bygd commons in Norway. More surprising for practitioner lab participants is the vitality and expansion of community lands in Europe at this time. Drivers vary, such as limiting expansion of mono-culture reforestation with proven high fire risks, partly a driver in Portugal, a new focus on local income generation that requires collective participation to be viable, the reinvigoration of abandoned lands, or new collective environmental initiatives looking for more viable ways to sustain natural resources. Restitution also plays a strong role; recognition of collective ownership as much a characteristic of post-socialist reforms as land returns to private individuals. Different tenure arrangements can exist in the same country, illustrated in the case of Romania in the following map. Often, the sense of “community” is being recreated with a modern twist to face current dilemmas, such as rural flight. While historically linked to their commonage, many members are now scattered in town and cities. This dispersal is a familiar problem, associated with a lack of young labour to protect, manage, and develop the estate, and to maximize its income-generating potential. 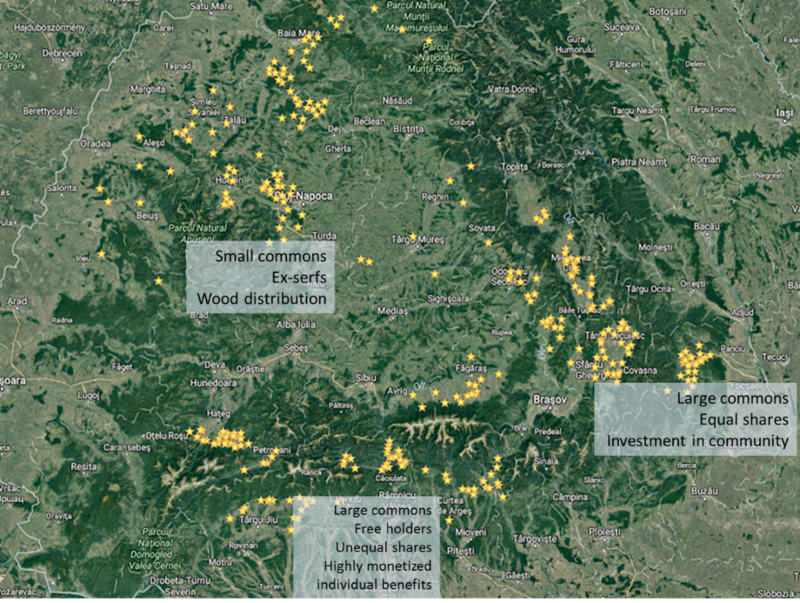 Where restitution of common lands to shareholders of the past is activated, tracing and engaging descendants in new boards and committees is time-consuming, and novel approaches being adopted to ensure workable quorums for decision-making (see Photo 1). In Portugal, youth are being engaged early on in community land activities and school syllabi on local common properties devised. At times benefit-sharing is being reoriented away from cash dividends in favour of a share in products. Work cycles are being amended to fit weekend labour availability. Nevertheless, there is a lot in European practices today that are familiar to community landholders in agrarian economies. The definition of adult members as the ultimate decision-making assembly, elected land committees for day-to-day management of the community land, establishment of bye-laws to regulate membership, access, use and disposal of commons resources, and mechanisms to protect the shared property from invasion or abuse are as familiar in Romania and Spain as in Mexico, Peru, Kenya and Vietnam. The modernization of ‘customs’ to respond to new realities is also familiar. Demonstration that collective entitlement is a viable modern form of ownership spans cases across continents. The general takeaway for land-dependent communities outside Europe is that communal ownership and governance of naturally collective land types still has a logic in advanced economies, and that privatization and commercialization of land use is not always the solution to sustaining rights and resources. A more specific takeaway is that where dwindling population and youthful labour are not yet major issues in agrarian localities, communities can look to Europe for creative innovations, and revitalization of ‘community’ as a construct across rural and urban domains. If you want to know more about LandMark or contribute information to the platform, please visit www.landmarkmap.org and/or contact us.